One of the original concepts put forward for getting to the Moon was the direct ascent mode, whereby a rocket from Earth left the planet on a direct trajectory for the Moon. A major objection to this plan was that it included no opportunity to check whether the spacecraft had come through the stresses of launch unscathed before committing it and its human crew to a lengthy journey in deep space. The competing arrangements - Earth orbit rendezvous and the ultimately successful lunar orbit rendezvous concept - did include a period in parking orbit around Earth as part of their mission plan, which permitted a comprehensive check to be made of the spacecraft's systems. Earth orbit was an important staging point on Apollo's lunar journey. It was 2% hours or so during which the crew and the flight controllers on the ground checked every system they could and prepared for the 5-minute translunar injection burn. For the first time in the flight, the spacecraft was being exposed to a true space environment after having endured the vibration and shock of launch and ascent. It was generally the task of the lunar module pilot (LMP) to work through a series of checklists to confirm the status of every major system on board the spacecraft. In this, he was normally aided by the commander. Careful checks were made of the environmental control system to ensure that the supply of oxygen to the crew was properly controlled, that the system was capable of providing necessary cooling for the many electronic and mechanical systems, and that it would maintain the cabin at a comfortable temperature for the crew. 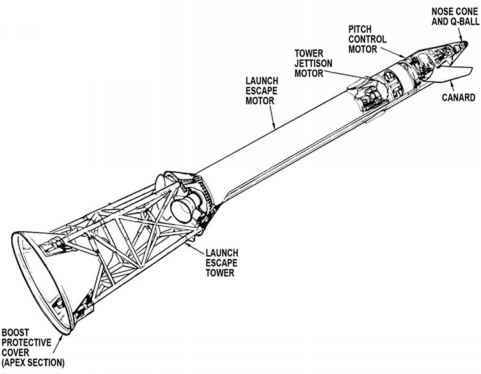 Special attention was given to the radiator panels on the side of the service module and the evaporators in the CM, which supplemented the radiators when cooling needs increased. The radiators carried pipes that took the hot fluid from the spacecraft and cooled it by radiation into space. If a leak had sprung in one of these panels, there would be no mission to the Moon. Neither would they be heading for the Moon if a problem arose in one of the sets of thrusters arranged around the spacecraft. These small, low-thrust rockets were the business end of the reaction control system (RCS) of which there were two: one each in the command and the service modules. While the thrusters built into the command module would only be required upon re-entry, those on the side of the service module were required throughout the mission and were crucial to just about everything that happened; from simply aiming the spacecraft for the collection of science data to controlling the spacecraft's attitude for critical operations such as guidance sightings, engine burns and thermal control.